I am hesitant to write this piece and declare to the world that we have taken the road less travelled, especially when it is about unschooling; and more so in this country where education is the lodestone, the holy grail, the way out of poverty; a step up (the only step up), where anecdotes tell of parents in the countryside selling their carabaos so that their children could go to school in the big city; where “dropout” is a bad word conjuring visions of neglect, of children left to fend for themselves in the streets; unloved, without futures, jobless and a bane to society. I have not told the family and only a few friends know. But tell this story I must, for it is a big part of what we are now. When I was a kid in the 80s, alternative learning was not a thing. I went through the regular route, a standard education: sitting in classrooms day in and day out listening to teachers spoonfeeding us facts that would help us pass exams to propel us through preschool, elementary, high school, and college so that we would come out on the other end molded into cookie cutter graduates armed with diplomas and ready to serve the waiting world in offices of corporations; model employees trained to follow instructions, to do what the big boss says and get rewarded with salaries and pay raises and benefits. Being a flawed albeit thinking human being and not a cog in some perfect machine designed by the men over at the Department of Education, something happened along the way to that perfect and perfectly planned future. I discovered John Holt. In my hometown, there was a book and video rental place I frequented. It was just a room at the back of a hardware store in the middle of the city market. That is where I found a copy of How Children Fail. It was a thin 1964 nonfiction, said to be the first book written by the father of Unschooling, author and educator John Holt. The book discussed failures in the classroom; how teachers fail to teach and how students quickly find out to get through it all without actually learning anything. At the time of writing, Holt was pushing for an overhaul of the educational system, citing much needed reforms. Later on, after realizing that the people in charge did not want changes, he started advocating alternative learning. He wrote more books, gave talks, and started a newsletter, Growing Without Schooling. That book became my refuge and my solace whenever my teenage self felt oppressed by the seemingly unreasonable demands of teachers, or when I felt the urge to pursue my personal projects but was constrained by school. I chafed at invisible ropes but, being a descendant of educators, I could not stray too far. Little did I know that I would eventually find myself exploring alternative methods of learning with my own children. By the time 2010 came around, homeschooling was a relatively established method of education in most parts of the world. There were books you could read, websites to follow; newsletters and magazines. There was a worldwide community of homeschoolers and homeschooling parents one could turn to for resources and support. In the Philippines, there were now institutions that offered homeschooling material and provided the paperwork necessary for accreditation. Much closer to home I was fortunate to know a friend who, aside from taking a doctorate in education and teaching a Master’s class in the subject, was at that time embarking on a new business, a homeschooling center. She would give me the courage I needed to homeschool the middle child while the oldest was off to college and the youngest was still too young for school. For two years we homeschooled. The then six-year-old learned what he had to know about science while taking walks outside. He solved math problems at home on paper and while doing groceries and performing kitchen chores. We made our own lapbooks and flash cards. We paid for the textbooks and test papers that came through the mail on schedule. We were slowly exploring an alternative way of learning, and discovering that it worked. Fast forward to five years later and here we are, trying out this thing called unschooling. 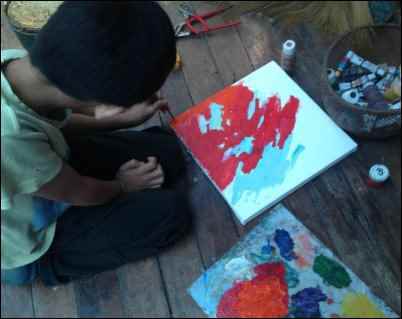 There are many ways to approach alternative learning and within the unschooling movement itself, many ways to define it. Going by the core principle of unschooling which values the independence and individuality of each learner, we plunge into this new adventure without a map but with open minds and much excitement. Our writing-based method requires the two unschoolers to write essays and poems and stories. Occasionally, they come up with Top 10 lists. So instead of trying to explain why unschooling is better, here are ten reasons from the kids themselves. 1. No bullies. There are no bullies in unschooling, usually. 2. You can do your subjects wherever you want. No sitting in a classroom all day! 3. You can study whatever you want. Whenever you want. 4. It is cheaper. No need to pay tuition fees so you only need to pay for projects. 5. It’s usually more fun than regular schooling. 6. No need for a schedule. Unless you want one. 7. You can go wherever. Wherever you want to go, wherever your parents want to go, you can go too. 8. More P.E. There’s more physical education in unschooling. 9. No homework. Actually it’s mostly homework in unschooling. 10. No need to wake up early. By early I mean waking up at around three or four A.M., because that’s usually the time I had to wake up when I wanted to get to school on time. Unschooling gave them more time to get comfortable in the kitchen. 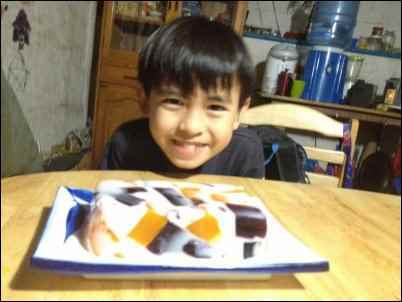 Kaaro with his cathedral cake. 1. Unschooling is more fun and more enjoyable than regular schooling. 2. You can be active, not just sit in a classroom all day. 3. It’s less expensive. No need to pay tuition fees. 4. You can learn more about your pets/animals. 5. No bullies, unless you’re one! 6. You can go to events and have more family time. 7. No schedule! At least usually. 8. Unschooling is like doing more subjects that you do at school and it’s like you do them all at once. 9. You can experiment more. 10. You can try to collect a set of something. I’m collecting Goosebumps books. And here is another Top 10 about the mountain. I am sharing this one because living in the mountain played a big part in our decision to unschool. The homesteading lifestyle and unschooling just seems to fit so beautifully. I don’t think we would have done it if we were still in an apartment in the city. 1. Climb a tree. Climbing trees is easy, you just have to find a tree then climb it. 2. Climb the mountain. Why go to a mountain and not climb it? 3. Camp out. And enjoy the night. 4. Make a fire. Make a barbecue and heat some marshmallows. Maybe cook dinner in it. 5. Explore. Find a cave, maybe some rocks to lie down on or jump on. 6. Go to sleep in some random place. Just make sure that there are no snakes or anything dangerous around. 7. Look for fossils or crystals. There are quite a lot of these around the top of the mountain. There are also a few caves with stalactites and/or stalagmites. 8. Go bird watching. Sometimes you can find some strange or not strange birds around. 9. Look and identify the different kinds of plants. Some of the plants that you see can be endangered or can only grow in a few places. 10. Get dirty. Roll around in the dirt or something. 1. Climb trees. This is fun and will make your muscles grow (and you can see the world around you). 2. Read a book. Especially when it is sunny and windy. 3. Climb up the mountain. Remember to bring food and water. 4. Have a picnic. Make sure you’re on a safe spot! 5. Play a game. Make sure you don’t just sit and do nothing. 6. Go camping. Tell stories too. 7. Enjoy marshmallows and barbeque. Do this while camping! 8. Make a fire. You need light and heat when you go camping. 9. Discover new plants. Maybe even new creatures. I thought that today was Sunday but it was actually Monday, so I was surprised when I heard the alarm ringing. I was so tired because I stayed up later than I do on school days. I was reading last night. I had toast for breakfast just like I usually do. Then I went down to the bar and waited for Kaaro (because he was still preparing) while sitting down in the bar where there usually is a fire. Kaaro was in the house. I waited with some paper and a pen to do math. When Kaaro and Nanay came down from the house I said, “hi” and then I continued to do my math. Kaaro and Nanay went down to Kaaro’s school. When Nanay came back from bringing Kaaro to school she said that she would sit down with me for a while. Then she went up to the house. And then after a while I followed Nanay up then I ate my lunch. After that I went to the mountain because I wanted to be alone and stayed there for a while. In the mountain I ran around and explored and tried to find new places to sit or rest. While I was in the mountain Kaaro was in his school and Nanay was in the house. I didn’t see anything new while I was in the mountain. I thought that that day was kind of quiet and short. One important step in the transition from the rigid schedule and curriculum of regular school to unschooling is something the experts call deschooling. The 11-year-old was the first one to break away from school. This was an essay he wrote last year about his deschooling experience. What the mountain taught me was that even the thing that you didn’t like, once it’s gone, you’re going to miss it in some way. The guys who are clearing up the mountain are ruining everything for me. Not as much birds visited today compared to last year. It’s getting hotter and hotter not like when there were lots of plants and the air was cool. The mountain also taught me not to judge things by the way they look. Some parts of the mountain looked normal but they made a big difference in my life. If I have problems I go to the mountain and talk to the mountain. Maybe you should too, if you live near (or on, like we do) a mountain. My ants live in a leaning pine tree that fell during a very strong storm. Their eggs are small and white. The ants are the medium sized ones and I can find them in the whole tree if I look. Their nursery is under some layers of pine bark in the main trunk. I made an “office” in the tree and discovered the ant’s nursery right beside the place that I lean on. I discovered the ants long ago and they moved a little closer to where I lean. I haven’t discovered their queen yet but I watch their eggs and sometimes give them crumbled food. When I give the ants crumbled food they usually go crazy and run either away or to the food. I suppose that that is because they are either frightened or happy about the food. Also, I found out that some of the food lasts for two to four days if I give the ants enough. I also study how the ants behave and I noticed that some ants stay in or around their nursery. Sometimes I can tell if one or more ants are nurses or guards for the nursery. Some of the other ants are always far away from the nursery. I suppose that these are the ones that look for food. More of the ants seem to be trying to get somewhere under the bark, usually with food, so I suppose that that is where the queen is but I don’t want to bother them just yet. I wonder what the ants were eating before I started giving them crumbled food. Maybe there are dead insects hidden under the bark of the tree? Or is pine bark edible? If so, do they eat it? I don’t know but I hope that I find out soon so that I can write it here. I did some research and found out what ants eat. They eat leaves. They chew the leaves of the pine and bring it back to their nest. I also learned that ants are herbivores, but not strictly though, they eat almost whatever they can find. I learned, accidentally, that ants have a built in step counter so they can go a hundred miles away from the nest and will not get lost. Some of the bigger ants have special body parts that they use to cut leaves from the twig, stem, or branch that it was connected to, the smaller ones just chew some parts off. We have a leaning falling tree in our house. The tree is leaning because of a typhoon. We (or at least I) call the tree Sweetheart. Sweetheart is a pine tree. Sweetheart is a good tree for climbing. My brother, Kalinaw, has his office there. It’s a branch with a not so sturdy table like thing he calls a “bookholder.” I love that tree. My two brothers are older than me. My oldest brother is called Kabu or Kabunyan. He is named after an Igorot god. Kabu, my mom (called Kelly) and my dad (who we don’t live with anymore and is called Marlon) don’t climb that tree. When you are up on my brother’s tree office you can see sunflowers and gumamela/hibiscus treelike bushes and plants. Sometimes Sweetheart blocks the path to the house or path to the bar, but I don’t hate Sweetheart for that. My brother has pet ants there. He feeds them from time to time. He sometimes gives them crumbly food. The ants have a big territory (at least for me). One time he bothered their nest and they had to move to another part of the tree. He puts a piece of bark on their nest. I don’t climb Sweetheart much. I don’t know why. It makes me sad when I think about it. 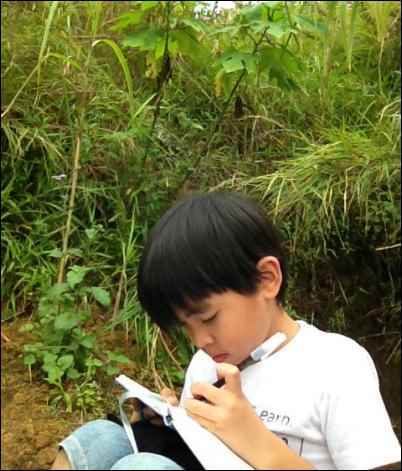 Kaaro writing and sketching on his book while resting on the trail. Kaaro, me, and Nanay arrived at Bencab Museum late because Nanay thought that the exhibit would start at six in the evening but it actually started at four in the evening. I decided to write about an artwork called The Beginning of History and Fatal Strategies. It was made by Norberto Roldan and it said that it was made with an assemblage with found objects. I chose that artwork because it was sort of like a sculpture but it was hanging on the wall like a painting. There were others like this but they were only made with a few materials but what I am writing about was made out of a lot of materials. One other artwork was made out of thread, it was called Clouds in My Mind but it was only made from thread. There was another artwork called Hawla by Max Balabat but I didn’t understand it much. The artwork that I chose to write about was made out of pictures, bottles with things inside them, and two things that looks to me like large buttons. The artwork made me feel sort of sad and a little confused. I chose that artwork because it made me feel the least confused. My questions are: how was it made? Where were these found objects found? And, lastly, what was in those bottles? Today I went to Mt Cloud Bookshop with Nanay and Kaaro for a mini-concert for kids called Jooma Jam in Casa Vallejo building in Upper Session Road. Mt Cloud hosts children’s events every 5th Saturday of the month. We got there late and somebody was saying something that I couldn’t hear properly. Then somebody else named Julianne, who was a famous singer and songwriter and she released an album called “Grateful”, went to the front and told everyone about how she and her singer friend wrote a song that they called the Color Song, which made me want to dance a bit. I saw somebody tapping his feet while I was looking around. Then she sang another song that she made called “Melancholy Moon” which made me kind of sleepy; and then she sang a song that I knew called “Over The Rainbow”. I was surprised when I heard it partly because I haven’t heard it in a long time. Then she sang another song that she made up, I think, called Hello. After that she sang a song while everybody clapped along to the tune, I think that the song was called “Happy”…??? Then two other people read a story, I don’t really remember the story but I think it had something to do with flowers. By this time Kuya Kabu had arrived. While they were telling the story, Nanay and Kuya Kabu left to go somewhere called Color World in Session Road. Then somebody said some more stuff about Jooma Jam and then it ended. I felt kind of sad and surprised because it ended sooner than I expected. Nanay and Kuya Kabu came back. Then Kuya Kabu left while Nanay was talking with somebody. I felt sort of impatient. After that we left. I think that it was fun, nice, and exciting but very tiring. One of the artworks I liked was called “Horse Power” by Melvin Culaba made from charcoal on paper. The artwork was a horse which reminded me of a thestral from Harry Potter. I liked the artwork because it had creatures. One of the other artworks I liked was called “Cascading Terraces” made by Ramon Orlina made of carved green glass. The shape of the artwork for me is unexplainable. I liked the artwork because it confused me a bit. The artwork was made in 2014. “Horse Power” was made in 2014 also. I liked the exhibit opening at Bencab Museum. The food there was delicious. They had palabok, lumpia (it was chili for the stuffing), garden sandwich (I forgot the stuffing), chips (I don’t know what kind, I think it was nachos). It was hard to eat palabok because they didn’t have a spoon or fork. There were other artworks I didn’t see at first but that I liked that also had creatures and they were “Amazing Horse” 2013 made of oil on canvas, which was a painting of someone on a white horse who is wearing a mask, his mask had a long pointed nose; and it was made by Jason Montindo; “Salakay” 2014, made of oil on canvas was a painting of lots of animals and insects on grass and then with two payloaders digging up some soil. It was made by Antipas Delotavo. “Weaving Dreams” 2014 made with acrylic on canvas by Roger Rishab Tibon. The details are too confusing to write. I didn’t choose to write about them first because I didn’t notice them. When my mom got her money from her painting, we ate at Volante and bought some small oranges (one of my favorites). My brother texted my mom that there was going to be blues at Café Yagam which was near Hotel Elizabeth. We arrived there early at 6:00. We learned what a cat’s cradle was. I love playing with the cat’s cradle. After a while my mom thought of making a poem. It was fun making the poem. Here are some stuff about Mt. Cloud, my favourite bookstore. Mt. Cloud is unique. You can have programs there. Mt. Cloud shares a building with Hill Station, Cinematheque, Casa Vallejo. Mt. Cloud is open from 10:30 am to 8:00 pm daily. All the children’s books are English & Filipino. They sell not only books but also calendars and the like. They have something called 3rd Monday from the Sun. Every 3rd Monday of a month they have poetry reading. They have something called 5th Saturday of the Month. They always change the theme and it’s a children’s activity. They do it every 5th Saturday of the month. 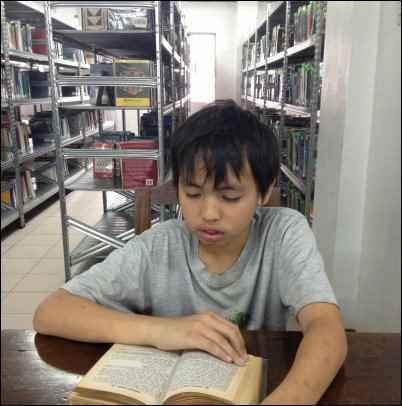 Avid readers that they are, a trip to the city library is always a treat.